By the time you enter high school, your table manners should be polished. 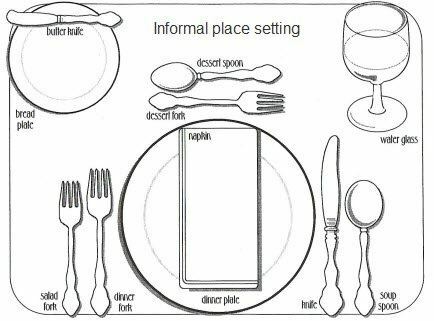 Here are the basics for formal dining or for everyday dining. In a restaurant, it's customary for the woman/women to follow the waiter/hostess and it's good manners to let them be seated first. If the waiter does not pull out the chair for all women, a gentleman should step-in and pull out the chair for her. Your fine-dining manners should be used at all restaurants. Pulling the chair out for a women while dining applies to the Cotillion events as well. All serving dishes are passed to the right. When serving yourself, only take the amount of food you know you will eat. To serve yourself a condiment, use the serving spoon to place the condiment on your plate. Do not put condiments directly on food. Place what you like on the side of your plate. French fries should be dipped in ketchup, not covered with it. Sit up straight. Do not lounge all over the table. Please lean slightly forward when eating so food does not fall on you or in your lap. Take small bites. Chew with your mouth closed. Do not talk with your mouth full. Do not slurp, smack, or make any other noises while dining. Turn away from the table to sneeze or cough, cover your mouth with your hand. Your napkin is not a suitable handkerchief, please go to the bathroom if you need to blow your nose. If you must burp, cover your mouth and say, “excuse me” quietly. If you must leave the table for an emergency, place your napkin on your chair. Never put a used napkin on a table during a meal. When cutting your food, keep your elbows relaxed. Hold your flatware gracefully. Don’t stab your food and saw with your knife. Never put more on your fork than will fit without falling off. Do not pick your teeth at the table! If food is stuck between your teeth, dislodge it with water. If that doesn’t work, excuse yourself. If a dish of mints or candy is offered, use the serving spoon and take only one or two pieces. Do not be messy ever, even when casually dining. When you are finished eating and leaving the table for good, you may place your loosely gathered napkin on the table to the right of your plate. Do not fold it. If you are close to the buffet serving area when the invitation to dine is given, go ahead and serve yourself first. However, if adults are present, go to the end of the food line and let adults go first, as a gesture of respect. Take small, not over-sized, portions of your favorite foods. Often individual portions are offered in buffets, so take only one portion of each food offered, so that everyone can eat. Be careful to replace the serving utensils for the convenience of the next person below the warming tray on the plate provided. If you drop a serving utensil into the buffet food, ask the server or your host to provide a clean one. Do not attempt to retrieve the utensil from the serving dish and use again. It should be carried away by a waiter and a new one provided. Please do not touch food in the buffet serving area with your fingers. Unless they have not provided utensils. Always use the provided serving utensil. If bread is offered without serving utensils, only handle the piece of bread or roll you intend to put on your plate. If you’re seated at a dinner table of 10 or less, wait for everyone at your table to be seated before you begin to eat. If you’re seated at a long banquet table, wait until those on either side of you are seated before you begin to eat. Appetizers are served first. Some are finger foods, some require special utensils. Some can be eaten with either a fork or a spoon, like a fruit cocktail. Seafood is eaten with a cocktail fork. Use your common sense. Crispy, dry bites of food are usually eaten with the fingers in a casual setting. In formal settings, use a fork. Don’t pile them on your plate. Soup - To eat soup, tip your spoon slightly away from you and fill it by moving it toward the back of the plate or bowl. Never blow on hot soup to cool it. Use the side of your soup spoon to cut any vegetables or meat in the soup. Do not use a knife to cut anything in a bowl. Never crumble crackers in your bowl. Oyster crackers may be placed in the bowl one or two at a time, keep the rest on your bread plate. When just a small amount of soup is left, tip the bowl away from you and use the spoon to get the rest. You may pick up and drink from soup cups or mugs that have handles. Never drink from a bowl without handles. If your soup is served from a large shallow soup plate, leave your spoon in it when you are finished. If it is served in a small bowl or cup, place your spoon on the serving plate underneath. Bread and Butter - When bread and rolls are passed to you, take one and place it on your bread plate then continue to pass to the right. When butter is passed to you, place the butter on your bread plate, not on your roll with your bread knife. With your fingers, break off one bite-size of bread, butter it with your knife, and eat. Never butter a whole piece of bread at one time and never bite into a roll or piece of bread. When no bread plate is provided, place it on your dinner plate, never on the table. Any other style condiments or pickles which are passed to you are also placed on the bread plate. You may use a small piece of bread to help push food onto your fork, but do it inconspicuously. To soak up sauce or gravy, spear a bite-size piece of bread with your fork, then dip it in the sauce or gravy. Salad - When your salad is served on a plate, you may use your salad knife to cut up large pieces of lettuce or vegetables. Use your dinner knife if the table is not set with a salad knife. Place the used knife on the side of the salad plate. When the waiter removes your plate he should bring you a clean knife. If not, request it. Cut up only a few bites of salad at a time. Eat around olives or veggies you don’t like. Never fish them out and put them on another plate, and never put them on anyone else’s plate. Always cut a cherry tomato with your knife and fork. Place your knife behind the tomato and slide the fork tines in gently, then cut, this method prevents it from shooting off into the universe. Salt and Pepper - Taste your food before you salt and pepper it. If your hostess has not placed salt and pepper on the table, do not ask for it. Always pass the salt and pepper shakers together and to the right. It is considered rude to use the salt and pepper before passing if someone has asked for it. Garnish - It is okay to eat all the pretty vegetables, fruits, and greens used to decorate your plate. If they are on your plate, they are edible. When squeezing a wedge of lemon, hold with one hand while you cup the other hand around it. That way you won’t squirt your dinner partner. Meat - All meat, fish, and poultry should be cut and eaten one bite at a time so that it stays warm and juicy. Never cut up an entire piece of meat before you begin eating. Don’t stab your meat with your fork or saw it with your knife. Remember to keep your elbows at your sides while cutting and eating your food. When dining informally, chicken on the bone, pork chops, and crisply cooked bacon may be eaten with your fingers. At a formal setting, even fried or baked chicken is eaten with a knife and fork. French fries are also eaten with a knife and fork if served with no other finger foods. Pasta - Long pasta, like spaghetti and fettucini, should be rolled, a few strands at a time, onto your fork with the help of a large spoon or the side of the dish. Shorter pasta can be eaten with a fork. Do not use the pasta spoon to put the pasta into your mouth. Trailing ends of pasta should be bitten off and returned to your plate with your fork. Do not slurp them into your mouth. Vegetables - Vegetables should be eaten with a fork or spoon. If necessary, cut up larger pieces with a knife. Remember, cut up just one or two bites at a time. You may use a small piece of bread to help push those last few peas onto your fork. Seeds, Pits, Bones, and Gristle - When you discover a seed, pit, or bone in food you are eating, chew as much meat from it as possible, then take it from your mouth with your fork. The rule is, the way it went in is the way it comes out. If something goes into your mouth with your fingers, like a fresh cherry, then the pit comes out with your fingers. Dessert - Creamy, juicy, or sauced desserts should be eaten with a spoon. Firmer, drier desserts should be eaten with a fork. Use your common sense. At a party, watch to see which utensil your hostess uses. Use a knife and fork to eat cream filled pastries. Some desserts that are served with a fork and spoon require cutting, like whole strawberries and cream. Hold a berry with the fork, cut and eat it with the spoon. Raw fruit and apples and pears should be quartered and cored, then eaten with your fingers. Grapes are eaten with your fingers. Finger Foods in an informal setting - Sandwiches, corn on the cob, barbecued chicken and ribs, crisp bacon, pickles, watermelon slices, and raw fruit are finger foods. French fries, chicken nuggets, and fish sticks are eaten with other finger foods. The above foods are not finger foods when served with a main course that requires the use of a knife and fork. Dinner Conversation - Interesting, lively conversation is the last ingredient of every good meal. Mealtime, especially dinner, is the time to relax, enjoy the good food and the good company of your family and friends. Turn off the television and leave your cell phone on "silent" in your purse or pocket, share your thoughts, tell what you have learned, listen, ask questions. Take an interest in those around you. BE POLITE. Wipe your lips with a napkin before taking a drink. Keep your lips together when chewing food. Keep your left hand in your lap while eating with your right hand. Take only a small amount of food on your fork at a time. Ask to have food passed. Don’t reach for food that is not directly in front of you. Don’t blow on your food to cool it. If you drop anything on the floor, leave it and ask your hostess for another. Don’t push your plate away from you when finished eating. Leave it where it is. Don’t talk about your personal likes and dislikes in food. Don’t play with your hair, and never comb it! Your food comes, and you panic because you don’t know which fork to use. The general rule is to start with the fork on the outside. That isn’t reassuring enough for many people, so even though you know the rule of thumb, let’s go into a little more detail. Remember, if the silverware you need isn’t on the table when you sit down, they will bring it when that course is served. SEAFOOD FORK (not pictured) — This fork is the smallest fork. It will have only three tines; the tines are the teeth of the fork. It’s used with seafood like oysters and shrimp. It may be found to the far left of your place setting, or it may be resting in the head of your far right soup spoon. SALAD FORK — This fork is larger than the seafood fork but smaller than your dinner fork. It will have four tines but will be shorter and fatter than your regular fork. DINNER FORK — This fork will look like the ones you see in your own home. DESSERT FORK — This fork is smaller than your regular fork, and you can recognize it by its placement. It will either be above your plate, or it will be set at the table during dessert. SOUP SPOON — This spoon will normally be at the far right of your place setting or will be delivered with the soup. Traditionally, there are two different types of soup spoons: one for the cream soup, and one for any other soup. The cream soup spoon has a round head, and the other soup spoon is shaped a little more like a dinner spoon, but larger. ICED TEA SPOON (not pictured) — This spoon is longer than a regular spoon, and the head may be a little smaller than the dinner spoon. DINNER SPOON (not pictured) — This spoon will look like the ones you normally see at home. DESSERT SPOON — This spoon is to be used with dessert, and will either be above your plate, or it will be placed on the table at dessert. REGULAR KNIFE — This knife is like the one you’re familiar with at home. STEAK KNIFE (not pictured) — This knife has a serrated edge and is sharper so you can cut meat with it. BUTTER KNIFE — This knife is smaller and will be found on your butter plate. It is to be used to take the butter from the serving plate, and to butter your bread. If you are dining at someone's home, the hostess tells the guests where she would like them to sit. The hostess puts her napkin in her lap first, then everyone else follows suit. No elbows on the table. Wait until everyone is seated and served before you begin eating. Watch for your hostess to begin eating first. Begin eating with the flatware that is furthest from your plate. When in doubt, watch the hostess. When your hostess serves you, you should always try a few bites of each dish. Never say you don't like something before you try it. If you must leave the table for an emergency, place your napkin on your chair. Never put a used napkin on a table during a meal. When you are finished eating and leaving the table for good, you may place your loosely gathered napkin on the table to the right of your plate. Do not fold it. Always remember to compliment the hostess on the nice meal. Always respond to an invitation by RSVPing by the date indicated. Your host/hostess has to plan for each event, and the number of guests that plan to attend is an important part of party planning. Never accept an invitation and then later say you can’t come because you want to accept a better offer. Always write a short thank-you note after the party. Dress appropriately for the occasion. Make an effort to be the cleanest and neatest you can be. Be a sport and take part in all activities, even if you think it may be boring. Do not get rough, wild, or act overly childish! No hostess cares for her party decorations being destroyed. Never wander through the host’s house. Do not fuss or make an issue over the size or type of food served. Do not ask for seconds, wait for them to be offered. Apologize if you spill something and offer to help clean it up. Arrive punctually at friends’ parties. Don’t overstay your welcome. Help clean up. Thank the host/hostess for the good time. Be attentive to your date, even if there’s someone much more exciting nearby to talk to. A man makes sure his date has danced and that she has a soft drink when she wants it. Public displays of physical affection are embarrassing to the observer and reflect poorly on those involved. It is both proper etiquette and a rule of the Sarasota Cotillion that Members must respond in writing to each invitation they receive to a Cotillion function. You will receive an invitation in the mail at least two weeks prior to each dance or event. A response/reservation card and an addressed return envelope will be enclosed. This card must be completed before the specified date and returned by mail to the appropriate Reservation Chair. Always respond, whether or not you plan to attend the Cotillion event. If you have indicated that you are going to attend a Cotillion function, but become ill or an emergency arises that would prevent your attendance, you must notify the Reservation Chair for that function before 3:00 PM on the day of the event. The name and contact information is available on the invitation, and it is listed on the Calendar of Events tab. Failure to properly respond to an invitation will result in an infraction, and, if repeated, may result in removal from eligibility for membership. If your R.S.V.P. indicated 'NO' but circumstances change has allowed your attendance, you may contact the appropriate R.S.V.P. Chairperson to inquire if you may be added to the guest list. Under no circumstances should you show up at the dance if your R.S.V.P. indicated a 'NO' without contacting and conversing with (no messages) the appropriate R.S.V.P. Chairperson. If you get voicemail or the answering machine. Example: “Hello. This is _______________. Could Ashley please call me when she gets home? My number is 555-3456. If you need to speak to the Reservation Chair because you cannot make your dance or you have a question, please follow the above message style, but speak loudly into the phone and speak clearly leaving your name (spell your name) and leave a return number with the reason you are calling. Repeat your name and number twice just in case there is static on the phone. Never eat or chew while speaking on the telephone. Limit conversations with others in the room while talking to someone. It is very rude to not give your listener full attention or chew in their ear. When you answer the phone, say, “Hello.” If your parents approve, you may then identify yourself by saying, “_________________ residence, (Your name) speaking.” If the caller does not give their name, do not ask who is calling. It is rude in a private home to ask, although it is polite for the caller to state their names. After the person asks to speak to someone, if they are home, say, “Just a minute please.” Then, go and get the person. Never stand by the phone and shout for the person wanted on the telephone. If the person is not at home, or is unavailable, tell the caller and offer to take a message. Say, “______________ can’t come to the phone right now, may I please take a message?” Be certain that you write down the message and give it to the appropriate person. If your telephone line has the call wait option, say, “Please excuse me while I find out who is on our other line.” Very quickly tell the second caller that you will return their call as soon as your first conversation is finished. Make sure you write down a telephone number and the person's name. If you are talking with your friends and an adult is calling for you or your parents, politely ask the adult to hold while you tell your friends you will call them back. Long distance calls also have priority. Sometimes you may not wish to interrupt the call during a long distance conversation. Turn your ringer OFF in public places (church, doctor's office, bank, movies). Use the 10 foot rule when talking on your phone in public places: Move at least 10 feet away from the closest person when talking. DO NOT snap pictures of someone without their permission. Grandmother Rule: Do not take a picture of anything you wouldn't show your grandmother. DO NOT text when angry or mad... this might result in saying things that you will regret later. If it is too late to call someone's home phone because their parents may answer, DO NOT call their cell phone or text them. The general rule of etiquette: Only call or text a person between 9:00 AM and 9:00 PM. DO NOT text anything you wouldn't say in person. DO NOT send or forward pictures of private parts... yours or anyone else's.... it is hard to make anything of this magnitude and disappear-including a bad reputation! Refer to Grandmother Rule. DO NOT use text messaging to inform someone of bad news, sad news or anything urgent... call. Private information can be forwarded, so do not text it! Your cell phone should go in your pocket when you are engaged in a conversation and never pull out your cell phone when you are dining. NEVER drive and text at the same time. If you must answer: Pull over, or ask someone in the car to read the message and respond for you. It is against the law to text and drive in the State of Florida. "What you post online really never goes away - even if you delete it." Google and a whole lot of other big companies out there are actually recording a lot of what we do online. Grandmother Rule: DO NOT post anything (pictures, videos, or words) that you wouldn't show to your grandmother! Colleges and places or employment are looking at FB and other social media. DO NOT post pictures or videos of people without their permission. Unfriend people if you receive inappropriate pictures or messages from them. Make sure your settings stay private and not viewable by everyone. Golden Rule: How would you feel if someone did that to you? Favorite Adult Test: If your favorite adult was watching, what would they think? Front Page Test: If your actions were recorded on the front page of the newspaper, what would other people think? If Everybody did it Test: What would happen if everyone did this? Real World Test: Would you do or say this face to face with someone? Introduce your date to your parents. Your date should be able to exchange a few polite words with your parents. Running short of money can be embarrassing for anyone. Everyone miscalculates from time to time. Please be ready to chip in extra and forget about repayment. The person who does the inviting usually pays all expenses of the evening or occasion. A boy should always go to the door for his date and see his date to the door. He should never blow his horn in the driveway to call for his date. It is always a woman’s prerogative to refuse an invitation from a man, but it is rude to delay a response while waiting for a better offer. A prom date should be invited at least one month ahead. The boy buys his date a corsage (thoughtfully inquiring ahead of time the color of her dress), and the girl buys the boy a boutonniere. A boy must always watch out for his date. At debutante dances and private parties, the boy should dance with the guest of honor and with the hostess at least once, if possible. A lady does not keep a man waiting for her, nor should a man keep a lady waiting. A man should always open the car door for his date. The traditional courtesy of a boy exiting the car and rushing around to open the door is not always necessary, but girls enjoy the extra attention, especially on a special occasion. Write promptly! Within a week is best but better late than never. Mention the gift and say something nice about it. If you received money, say how you will spend it or what you plan to do with it. Remember, grandmothers love thank-you notes. They make them feel special and appreciated. Has invited you as a house-guest. Has done something nice for you. Has given you a gift.